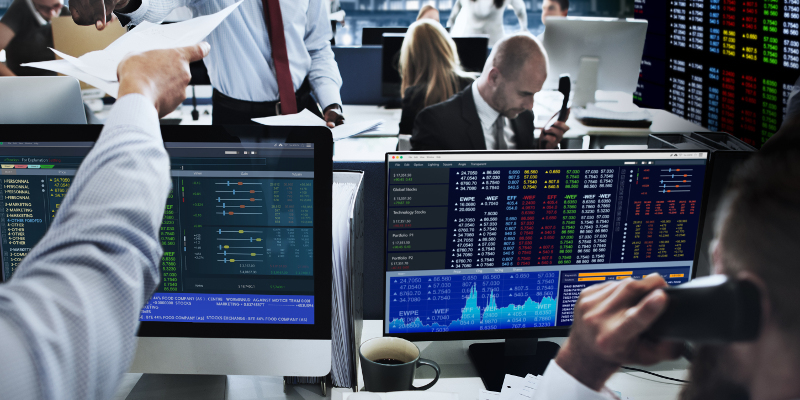 US Equities have rolled over but is this the market top? You are here: Home / US Equities have rolled over but is this the market top? The market reversed lower as predicted, now what? 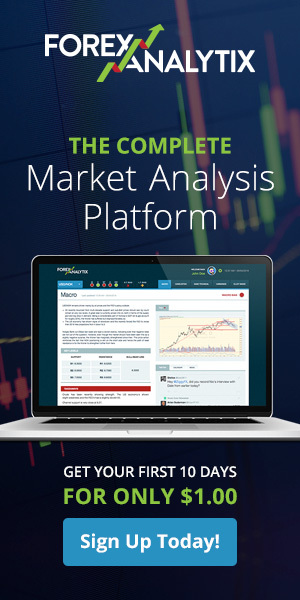 The US equity markets are trading heavy after a strong selloff, is there more selling to come? 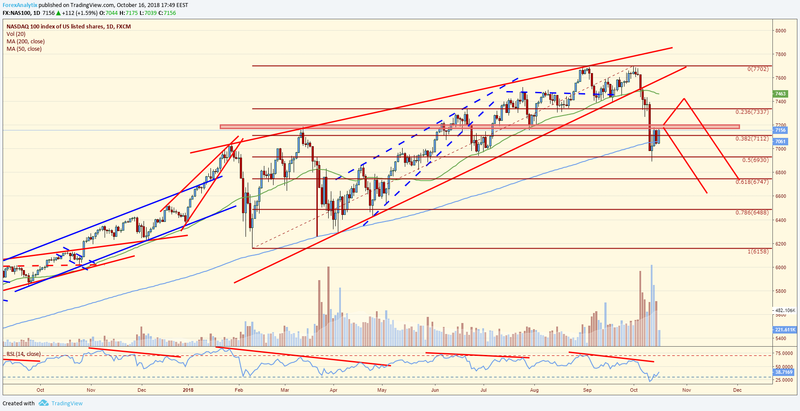 A couple weeks back, we had identified the ascending wedge in the SPX (and other indices) which lead to a steep selloff last week in the US equity markets (see our previous post HERE). Just a couple of days later, our own Joe Perry was on Bloomberg TV presenting our market perspective to a global audience just before the big turn lower in the US indices that ensued. A technical outlook of the major US indices. The failure in the SPX led to a move lower in the USDJPY currency pair in what looked like a bullish breakout 2 weeks ago. 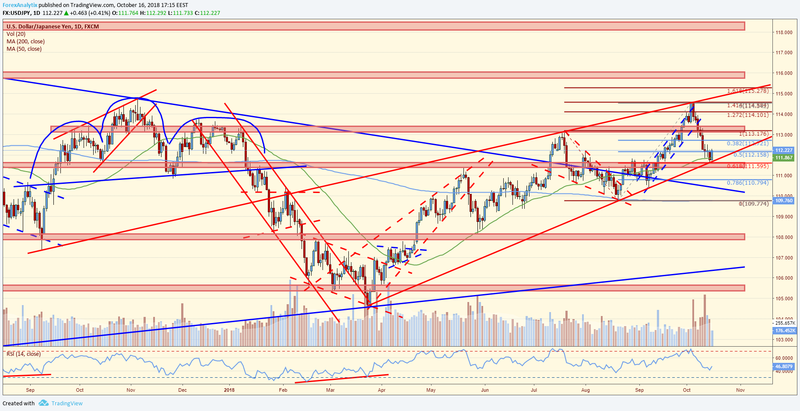 The problem is that the USDJPY is now approaching key support, and if broken could lead to another round of selling in the equity markets as well. The risk near term that the stock market put in a high is increasing. The fact of the matter is that rallies are fairly shallow and being sold. But the good news is that strong support for the markets are very close, and that could be good for the bulls. On the other hand, if these support levels are broken, the risk of a further technical deterioration is high and that could signal a pretty but shift in trend and sentiment in the weeks ahead. If you take a look at the USDJPY below, you will notice we are now testing a trendline near the 111.60 level, and if this level is broken, it could lead to a rush of selling in the pair. The 111.62 level is also a 61.8% Fibonacci retracement level which makes it even more important. The good news is that downside may be limited to the 110.00 level given that it is the long term broken trend line of the USDJPY on a weekly basis and the 200DMA is just below. If we manage to hold the 110.00 level, this could help limit downside in the US equity markets too, which are highly correlated to the USDJPY currency pair. The S&P 500 (SPX) is trading near some key support as the daily relative strength continues to trade in oversold conditions. 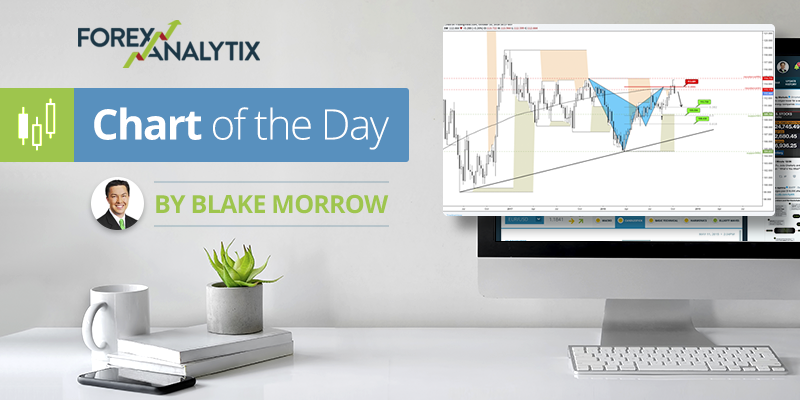 The key support we are paying attention to is the 2690 level which is a confluence of a long term daily trend line (early 2017), a 61.8% retracement of the 2018 trading range, and horizontal support from May of this year. In the event the USDJPY break lower, this support at 2690 will be an important support level to defend. 2790 is the closest level of resistance but even if the index breaks above it 2815 and 2845 might prove important resistance zones. 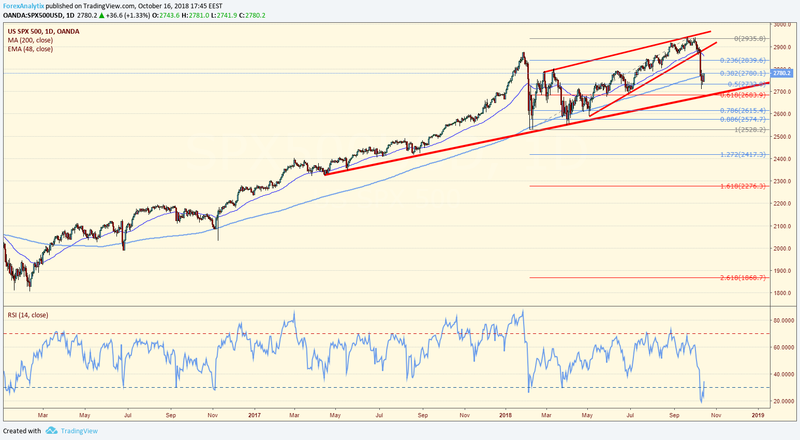 The Nasdaq tested the ascending wedge’s resistance and after forming a double top broke below the ascending wedge just to stall at the 50% Fib of this year’s range. It is currently re-testing hte horizontal support / resistance area at 7200 and even if it break above it we would expect another leg lower to start sooner rather than later. Watch 7340 and 7400 as possible resistances. The next D/S target is the 61.8% Fib at 6747 but we need to stress that according to the theory an ascending wedge can retrace 100% of the move higher which would imply a move back at 6158. The IWM (Russell 2000 ETF) rolled over in August way before the other US indices did from a confluence of resistances acting as a bellwether. 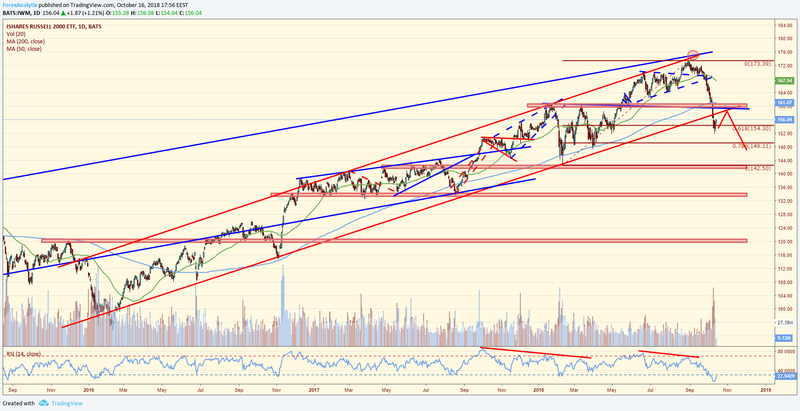 After a strong move lower it has now closed below an ascending channel’s support that was defining the uptrend since early 2016 and a key horizontal support / resistance area that was important during this year. Any rebound towards the 160 breakdown level should find sellers as an eventual move towards the 142.50 would not surprise as at all. 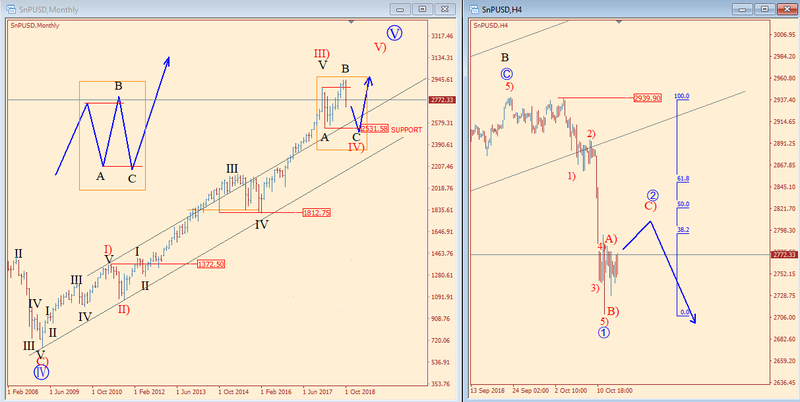 The Elliott Wave Perspective for the market turn. Always when looking at a price chart, especially at higher time frame, where the direction is clearly defined, I try to label the wave count so that you always expect more upside in an uptrend, or downside in downtrend. So whenever stock market makes a sharp turn down from the highs, take a step back and look at the market from the distance, and not fall in some kind of “fear trap” that is spreading in media as soon as the market drops. With that in mind, I assume that reversal on S&P500 can be just another correction on the way up. But is it over? From an EW perspective, I am looking at a flat formation, and as I know from experience, stock market loves making flat formations where a lot of investors try to join the trend on failure breaks to new highs, or failure break of the swing low. In our case that important swing low that can act as a support is at 2530; so rather than looking for a downtrend resumption down there, I would look for a bounce. But that’s still 250 points away, so despite my long-term bullish outlook, there is the opportunity to make money on the downside in the near-term. Be aware of the potential for a rally back to 2800-2850 first.